In May of 2009 Anne and I were in NYC. We and friends from Saint Louis had traveled to the Big Apple to participate in the five boroughs bicycle ride. Some of our friends had brought their own bikes with them, but we chose to rent instead. We picked up our bikes the day before the ride in Battery Park, at the southern tip of Manhattan. Our hotel was near Times Square, so we cycled from Battery Park up to 44th St. Primarily, we rode on the West Side Greenway, site of yesterday’s terrorist attack. That day, like yesterday, was a beautiful day in New York. The bike path on the greenway is both wide and completely separated from the adjacent roadway. The greenway is separated with raised traffic islands. We felt very safe while riding on that bike path. When we neared 44th, we turned inland and soon ran into congestion and had to dismount and walk the rest of the way back to the hotel. That was a beautiful day, but unfortunately the next day, the actual day of the ride was a cold and rainy one. It started off dry though and in the early hours of Sunday morning, Anne and I rode south from the hotel to the ride’s starting point, again near Battery Park. At that early hour, there was almost no traffic, so we rode right down Broadway. 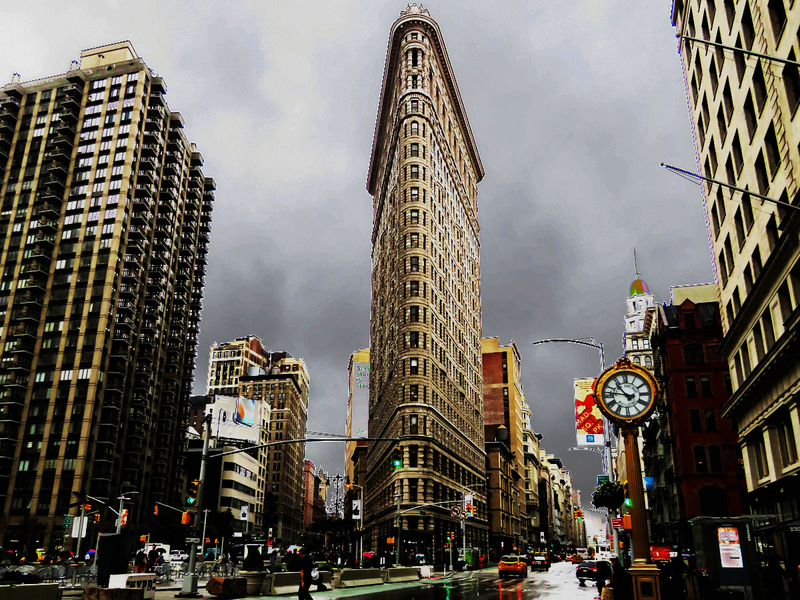 I remember seeing the Flatiron building for the first time that morning and stopping to photograph it. It looked similar to the above photo. As we continued south more and more other bicyclists joined us, as we all headed towards the ride’s starting point. That ride to the ride was the most enjoyable bicycling experience of the trip, but the previous day’s ride up West Side Greenway was a close second. Years later, when Anne and I were doing one of the League of Michigan bicycle rides, we met a woman from NYC who was also on the ride. We told her that we had ridden the 5 Boroughs ride and that we still got regular emails from them. Her first comment was, “Unsubscribe!” She later explained that although she regularly rode in the city, she would never ride that ride again. Even without the awful weather that we had, I would have to agree with her. 30,000 bicycle riders is way too many for such a city ride, but if the opportunity ever presented itself again, I would still ride the West Side Greenway again, in a heartbeat. This entry was posted in Bicycling, Photography, Saint Louis and tagged NYC by RegenAxe. Bookmark the permalink.